This custom Santa Fe styled home offers close-in country living with easy access to town, I-25, and nearby parks and open space. Nestled on 37.7 acres, the home sits on a knoll and overlooks the surrounding meadows and easterly vistas of designated open space. As you approach the home, a lovely meandering driveway leads to the home through towering pines. And, once you arrive, you won’t be disappointed! 4,487 Square Feet with 3,088 on the main level and 1399 on the upper level. Huge, heated garage with 2,334 square feet. Garage features an RV bay, 2 additional bays, 2 storage rooms, a mud room area and a utility area with back-up generator. 37.7 Useable acres with a large fenced section for pets. Radiant in floor heat & Whole house cooling fan. The logically designed flow of this exceptional home begins in the ample entrance hall that features a unique pine wood barreled ceiling, coat closet and a tiled floor with inlaid medallion made of copper ore and turquoise nuggets. At the end of the hall, an arched entrance opens to the great room. Off the entrance hall, the powder room has tiled floors and a vanity topped with massive slab of slate. The fabulous great room boasts a 19’ beamed ceiling, tiled floors and three sets of 8’ French sliders that frame the lush setting. The living room area of the great room has built-in bookcases, a nook for your TV, a gas burning stove and a ceiling fan. The dining room has a chandelier, built-in china cabinet and dramatic arched accent wall. The great room opens to a charming flagstone patio with pergola roof and gas line. The patio overlooks the fenced side yard that features a KOI pond with water fall and delightful bridge. This area also offers a Chinese barbeque smoker and large blocks of red sandstone that add interest to the yard. (These blocks of sandstone came from an old bar in downtown Colorado Springs that was torn down.) Beyond the fence, the property extends a considerable distance and adjoins the Pineries Open Space. The upscale kitchen and casual dining area have tiled floors and enjoy great windows. The kitchen features a big center isle with slab granite counter and convenient work station. 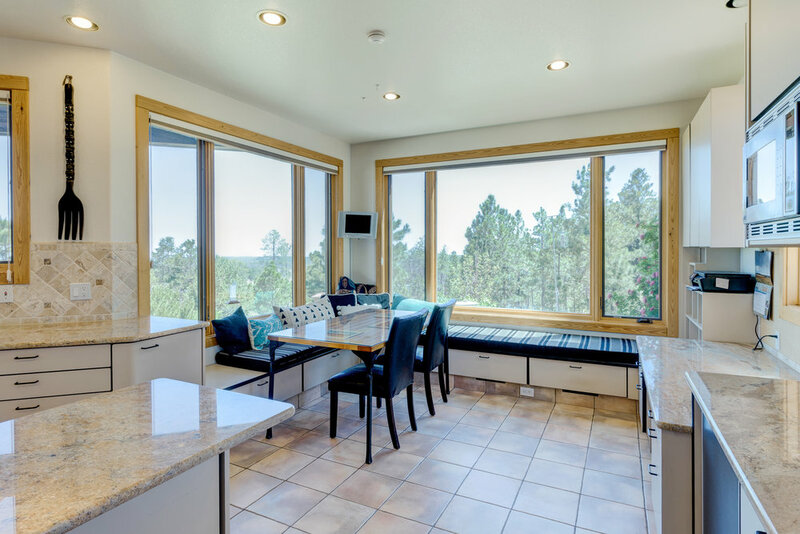 Kitchen appliances include a 4-burner gas cooktop with grill, a Sub Zero refrigerator with microwave, dishwasher, microwave, double ovens and beverage fridge. Next to the kitchen, an oversized walk-in pantry that also doubles as the laundry room offers a plethora of storage. Well designed, the pantry/laundry has two double doors that allow easy access from the garage to the kitchen and pantry for your groceries. The spacious master suite has big windows that frame the views plus a glass door that accesses the flagstone patio. Off the master bedroom, there is double vanity with slab granite counters and tiled floors. Then, there is a separate bathing area with tiled floors, deep jetted tub, walk-in tiled shower and another vanity with sink. Next to the bath, there is an oversized closet with built-ins. On the upper level, there is a 22’ X 15’ office/loft that has an overlook into the great room. This room has built-in bookcases and a built-in desk. This open and versatile space could serve numerous purposes and could easily be converted into a third bedroom. Guest bedroom with adjacent bathroom. The bathroom has a charming claw-foot tub and a cute tiled floor with an occasional periwinkle. Completing the upper level is the catwalk that leads to a cozy little sitting area with bookshelves. Great place to relax!